Last week’s House Oversight and Government Reform Committee hearing on predatory prescription drug pricing didn’t offer much insight into the pharmaceutical industry’s controversial research and marketing strategies. But it sparked a media circus around former Turing Pharmaceutical CEO Martin Shkreli, who sat smirking but largely silent as lawmakers probed his decision to jack up the price of a drug needed by victims of infectious diseases by 5,000 percent. The hearing was just a foretaste of what the pharmaceutical industry can expect in months to come as rising drug prices have moved front and center in the national debate over healthcare costs and are a likely target for legislative action as the 2016 presidential and congressional campaigns heat up. Bracing for a legislative onslaught, the drug industry is launching a new advertising campaign designed to improve its tarnished image among lawmakers and consumers, according to The Wall Street Journal. The drug industry’s largest trade group, the Pharmaceutical Research and Manufacturers of America (PhRMA), told the Journal that it plans to spend “several million dollars this year” on digital, radio and print ads that stress the industry’s role in developing new drugs and advances in science – while steering clear of the drug pricing controversy itself. Expect to see a lot of gauzy ads featuring patients who have been helped or saved by newly developed drugs. The ad campaign is coinciding with what some congressional aides describe as a major bump in lobbying activity by drug manufacturers. 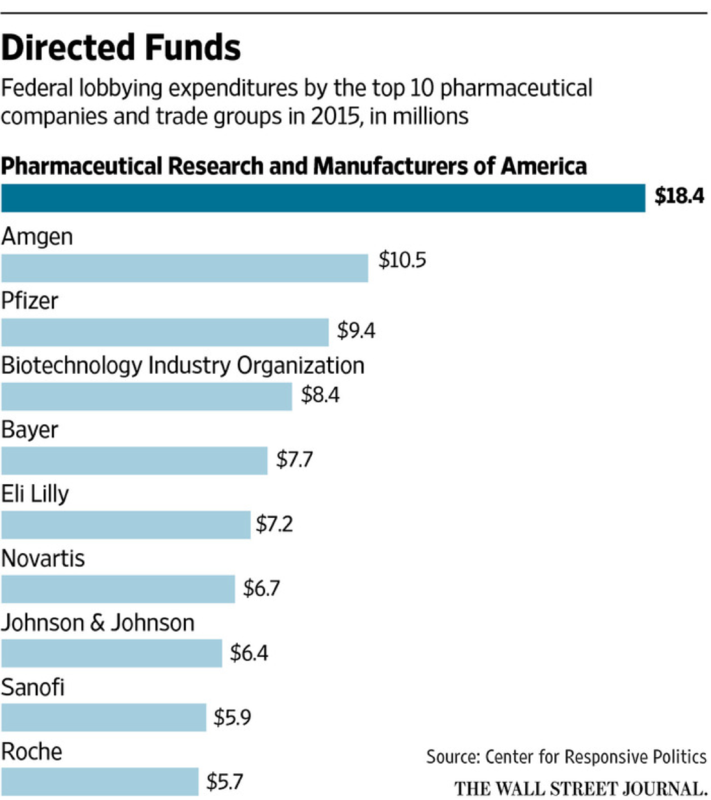 Last year, PhRMA reported spending $18.45 million lobbying federal officials on a broad range of issues, an 11 percent increase from 2014, according to the Center for Responsive Politics.